I want to help PENTON owners get information that has been gathered and saved over the years from many PENTON owners. 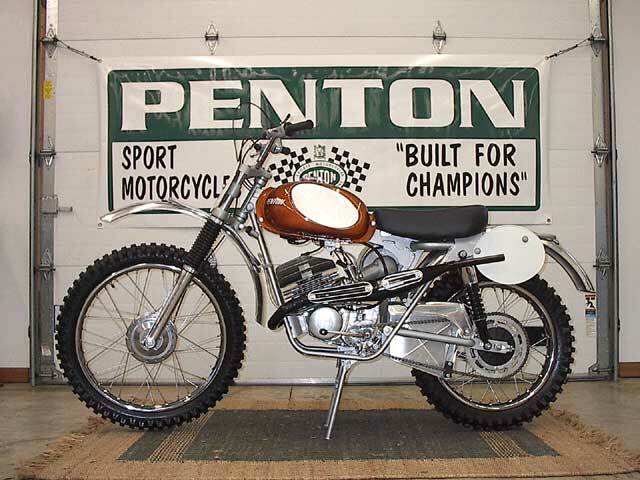 PENTON motorcycles was always changing. So if you see something listed here that is not correct, please e-mail me. My good friend who has been collecting PENTON bikes for years helped me with this information. Thank You. Frame Numbers: 1972 through 1977 all have eight numbers on the steering head. The last five are the searial number. The first three is a code for the date it was made. The first number is the year. The second number is the month. (20251030 would be February 1972). The 2 meaning 1972 and the 02 meaning the second month, February. Some even had a 7 or 51 or 54 ahead of all the other numbers. The 1976 - 1977 PENTON MC5 model and the 1977 GS6 model used something different. They started with 550 for the MC5 model and 701 for the GS6 model. But always remember the last five numbers are the serial number. Engine Numbers: The engine case has the number stamped on it on the ignition side. The first number is the model year and the next two numbers tell the size of the motor. Once again the last five numbers are the serial number. (the first number 4 would mean 1974). The numbers went like this. 51 means 125cc & 52 means 175cc & 54 means 250cc & 55 means 400cc. Sachs 100cc motor with a 5 speed called the "Berkshire" Red in color on the air box, the rear shock body and the gas tank. Sachs 125cc motor with a 5 speed called the "Six Day" Green in color on the air box, the rear shock body and the gas tank. Every frame came painted silver. All gas tanks were 2.5 gallon and made out of steel. Small PENTON decals, white in color with the name and motor size on the upper front sides of the gas tank with the lettering being either straight or angeled. The Sachs motors all came with a cast iron cyclinder (Known as the Iron Barrel) and a vertical finned head or a short finned Sachs sunburst high compression head or even a PUCH short finned sunburst head that overhung the cyclinder. The Sachs engines came with a Bosch ignition that used points and had a 24mm Bing caruretor on them. The air box was cast aluminum 10 1/4 inches in size tall enclosed frame style. Then later same year models came with a smaller shortened 7 1/2 inch tall version air box for better air flow. The frames came without welded on fork stops if it was equipped with Ceriani steering dampener that contained an adjustable dampener knob on the triple clamp and self contained fork stops. Later that year same tear models came with the frame welded fork stops and no steering dampener unit on them. The early model PENTON gas tank came with a twist off gas cap and the later models came with a flip top gas cap. Their was a two piece engine mount on the front. The exhaust pipe was chrome. The seat was 15 inches long and the bike had 35mm Ceriani forks on it with the long rubber accordion boots for protection. The fully covered rear shocks were also Ceriani with the model year paint color on them and finished in chrome. The rear sprocket assembly was a 4 bolt carrier hub assembly and had a 20 inch steel chain guard along the top. Also had a curved style center stand. The controls were made by Magura in oval shape and then later in round shape. Three inch narrow aluminum front fenders and a tubular style front fender brace was used. A non high breather frame with a skid plate welded to it. The exhaust pipe had a stinger tip on it. Cast aluminum barrel style front and rear hubs were used. The rims were either aluminum or chrome with chrome spokes. The head lite was a large color coordinated long bullet shape being 5 3/4 inch in diameter and 7 3/4 inch long. A lot of things were the same as the 1968 except the following. The Ceriani rear shocks are now painted black with the chrome bell top. Shorter chain guard made of aluminum and only 11 inches along the top of it. New high breather frame with a 8 inch round air box with a plastic grey cover on it. Now a 6 bolt rear sprocket carrier. The spokes are painted silver. Center stand is straight with a flattened angled mounting area. An experimental 175cc Jackpiner is unvieled. Bronze in color with silver side panels and a 175cc PUCH engine. Six speed with the Bosch ignition and a 27mm Bing carb. Also came with Cerani front forks and rear shocks and the Magura controls on it. Never was put in production. A new second 175cc Jackpiner was introduced in a small quanity mounted with a blue gas tank and white side panels with a white PENTON Jackpiner sticker on the gas tank sides. Even some 175cc blue gas tanks were found with the 125cc Six Day stickers on the sides of the gas tank. The Sachs motor used on the early 175cc Jackpiner was actually a 152cc Sachs cast iron conversion kit. They were actually Berkshire bikes converted over because the Berkshire was not selling well. The Sachs 100cc and the 125cc motors are now aluminum and have the wide sunburst head for much better cooling. Bosch ignitions were still used and they still had a 27mm Bing carb. The exhaust now comes with a removable muffler. The swingarms are made more sturdy with gussets welded on them. The head lite is 5 3/4 inch bowl shape. A lot of things were the same as the 1969 except the following. They now come with a longer 20 inch seat. The same 35mm Ceriani front forks without the rubber boots. The center stand is straight. A wider front fender brace. A frame extension is put on to mount a moto cross down pipe. Gas tank comes with holes to mount a leather tool bag on it. Rear frame loop is strengthened. The skid plate is now removable and the frame tabs are enlarged for the swing arm pivot bolt. All the same as 1970 except two changes. They put on triangular gussets between the top of the rear engine mount and the frame. The head lite is still 5 3/4 inch bowl shape or a 4 inch smaller bullet type shape. A year of new redesign totally of the Berkshire 100cc model and the Six Day 125cc model with starting serial numbers beginning at 10600000. Remember the first number is the year and the next two are the month (1=1971 & 06=June). The new 175cc Jackpiner is now equipped with a brand new KTM motor. The new Jackpiner has a light blu gas tank and air box with yellow number plates. The KTM motor is black with a Motoplat ignition, gear box with a six speed transmission, aluminum cyclinder and head and a 30mm Amal carb. The serial numbers of the early Jackpiners started with 7-206xxxxx. (The 7 meaning a production code and the next three numbers being the yaer and month. The exhaust pipe on the new Jackpiner has a 2 ported outlet muffler bolted on with 3 nuts & bolts. The 100cc Berkshire is still painted red. The 125cc Six Day is still painted green. Both the 100cc & the 125cc still have the Sachs motors on them. The early 1972 Sachs motors known as the 5A used on the 100cc Berkshire and the 125cc Six Day came with the Bosch point style ignition and had a 5 speed transmission. The newer updated version Sachs motors known as the 6B came with a 6 speed transmission, both still with a aluminum cyclinder and sunburst head and a 27.5mm Bing carb. The front forks are 32mm Ceriani. The Berkshire and the Six Day had 6 1/4 inch center leg distance. The later models of the Berkshire and the Six Day and all the Jackpiners came with 6 3/4 inch distance. The exhaust pipes on the 100cc Berkshire and the 125cc Six Day now have a cone shaped muffler with an internal baffle held in place with 3 springs. The frame used now is made of Chrome Moly tubing and all frames are painted grey and are Non-High breather frames. The new larger gas tank, 3.1 gallon was nicknamed the toaster tank is now made of fiberglass as is the air box. The model name and engine size is on the sides of the gas tank in white with two lines underneath. Magura controls still on them. new cast iron style hubs, front & rear. Chrome steel rims. Ceriani rear shocks. Side stand is underneath the swingarm on the left side of the bike. comes equipped with a removable heat shield on the exhaust pipe. The air box comes with a triangular shaped aluminum cover that is painted, that also is formed with the number plate on it. Still aluminum front & rear fenders. A leather strap holds the gas tanks on by a buckle design. The head lite is a small 4 inch bullet type shape. 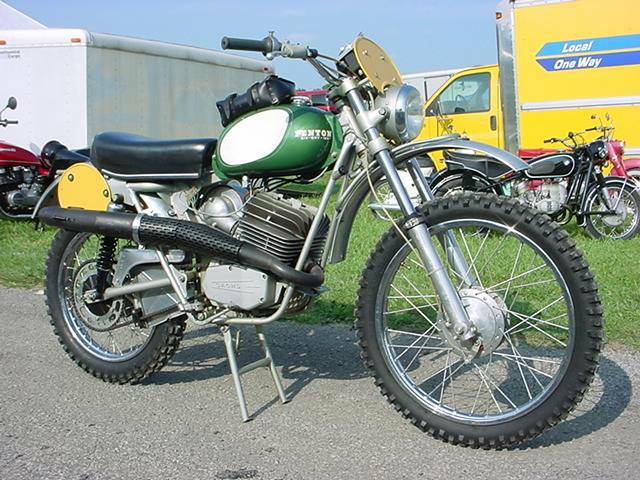 This is the first Observed trials bike introduced. It is known as the Mud-Lark. It is mounted still with a Sachs 125cc motor, still the 6B 6speed version and has the Bosch style ignition with points and condensor, or the Motoplat style ignition. Still has the aluminum cyclinder and sunburst head and has a 22mm Amal carb. They also made other engines available. An alloy Sachs 5 speed, cast iron 5 speed, and a 152cc upgrade Sachs motor with both the 5 & 6 speed transmissions. The gas tank was narrow polished aluminum and is only 1.5 gallon. The front and rear hubs are also polished aluminum and called conical hubs. The frame is 531 Reynolds tubing with a hammered silver paint on it. Ground clearance is 12 1/2 inches. The fenders and the air cleaner and chain guard are all polished aluminum. Still has an air box. Front forks are M.P. 600 trledraulic with a Timken tapered roller bearing steering head. Now with Girling rear shocks. a torque pipe or a big bore chrome exhaust pipe with a matte black finish with a polished chrome aluminum heat shield. It is equipped with a constant drip chain oiler which is filled at the main frame tube. A chain tensioner that is spring loaded. The rear brake is cable actuated and comes with controls made by The Ted Wassell family.